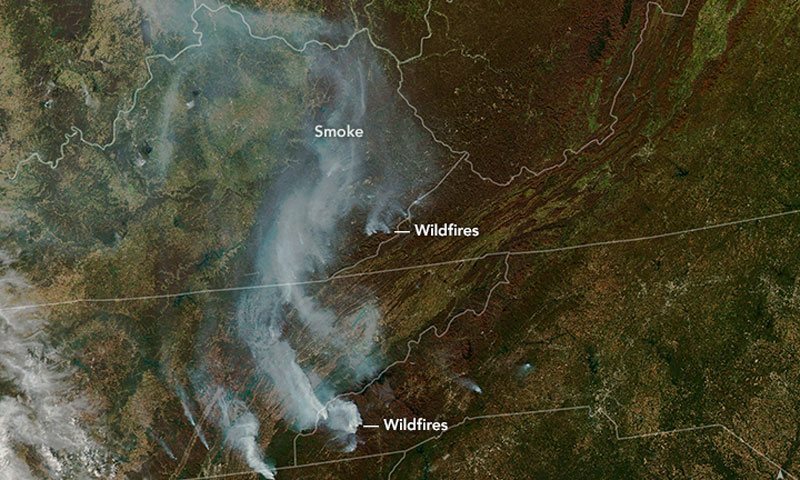 Two opposing weather situations are playing out right now in the Southeast: While parts of North Carolina are submerged thanks to a record downpour, Florida is battling wildfires fueled by a drought that now outranks the one in California. While these conditions sit at opposite ends of the weather seesaw, both may be affected by a changing climate. Heavy downpours have been on the rise and are expected to continue increasing across the Southeast — and the whole U.S. — as temperatures climb. Those same rising temperatures are also likely to exacerbate future droughts. A storm system has dumped several inches of rain across eastern North Carolina since Sunday, with some areas around Raleigh reporting 7 to 8 inches in the 48 hours ending at 8 a.m. on Tuesday. The 4.51 inches that fell at the airport beat the previous one-day April precipitation record of 3.37 inches. Entrance to River Park in Hillsborough. That large, fast influx of water caused rivers and creeks to rise rapidly and flooded roads, parking lots and homes. Local media reported several water rescues as officials warned residents to avoid flooded roadways. A flash flood warning was put in place for the area until 11:30 p.m. Tuesday. 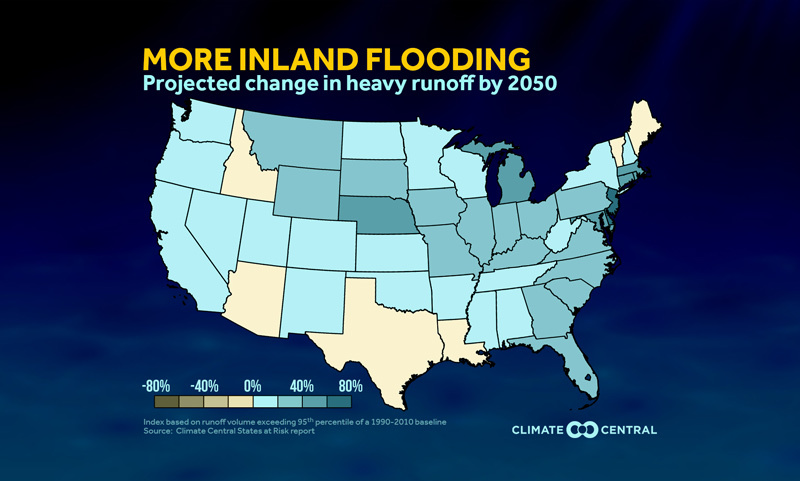 While such heavy downpours and resulting floods have always happened, they are expected to happen more often and dump even more rain as global temperatures rise because of the excess heat trapped by human greenhouse gas emissions. 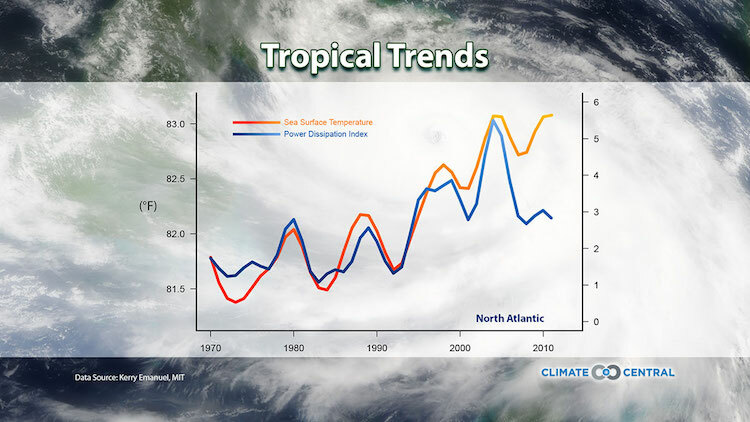 This happens because a warmer atmosphere holds more moisture, which makes more water available to rainstorms. A December study found that extreme rainstorms that currently occur about once a season could happen five times a season by century’s end and that such storms will drop about 70 percent more rain in the future. This warming-driven trend in more heavy downpours is already evident across the U.S. and the Southeast. 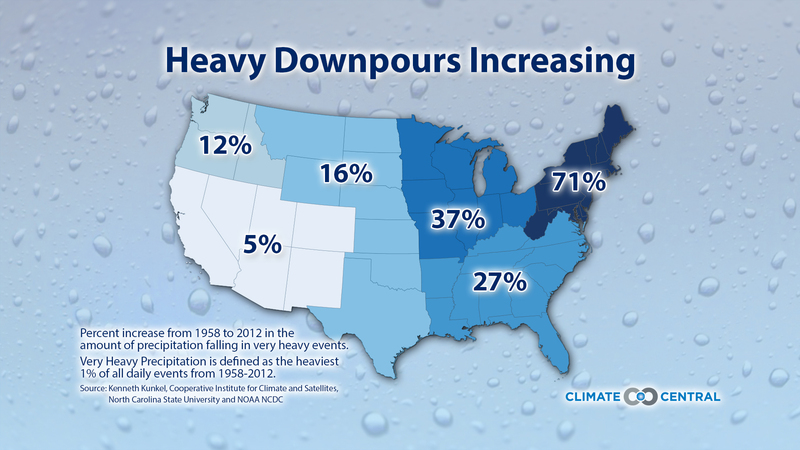 Between 1958 and 2012, the heaviest 1 percent of all rainfall events have risen by 27 percent in Southeast, according to the 2014 National Climate Assessment. Several studies have found that warming has made major rain-caused flooding events more likely, including ones last year in Baton Rouge, La. The current rain event follows two much more catastrophic ones in recent years: a 1-in-9,000 year rainfall event in South Carolina in 2015 and major deluges and flooding from last year’s Hurricane Matthew. 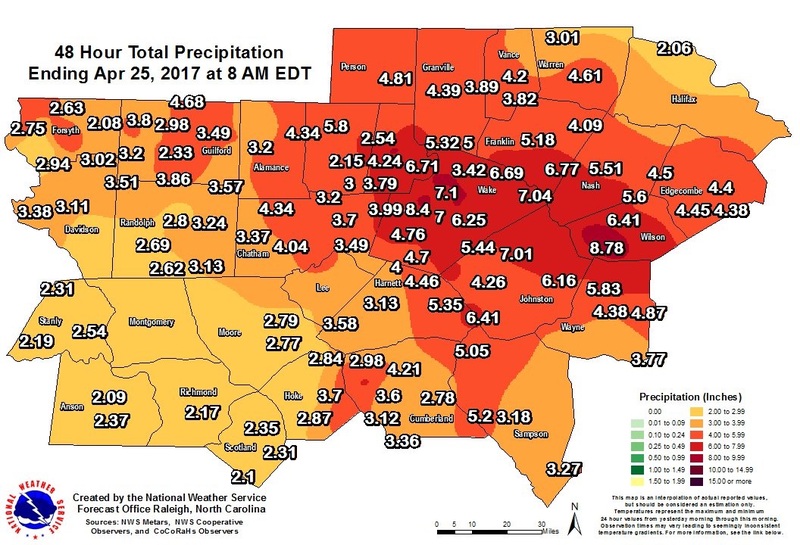 48-hour rainfall amounts in the Raleigh, N.C., area ending at 8 a.m. on April 25. 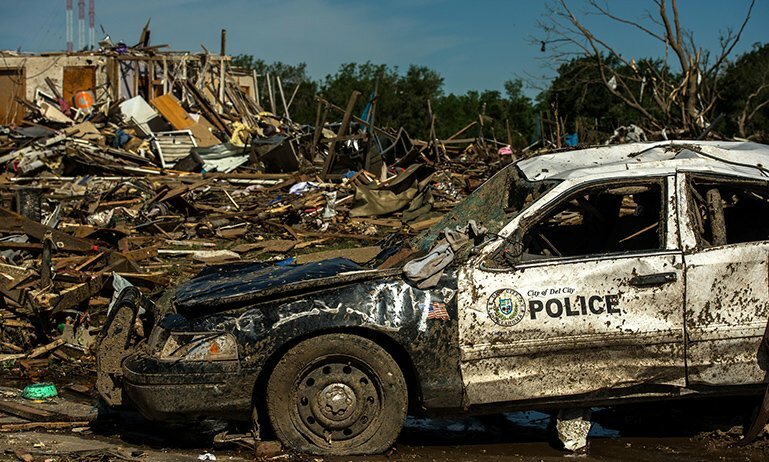 “The number of heavy events has continued to be well above average over the last couple of years, maintaining the upward trend,” Ken Kunkel, a climate scientist with the North Carolina Institute for Climate Studies and N.C. State University, said in an email. 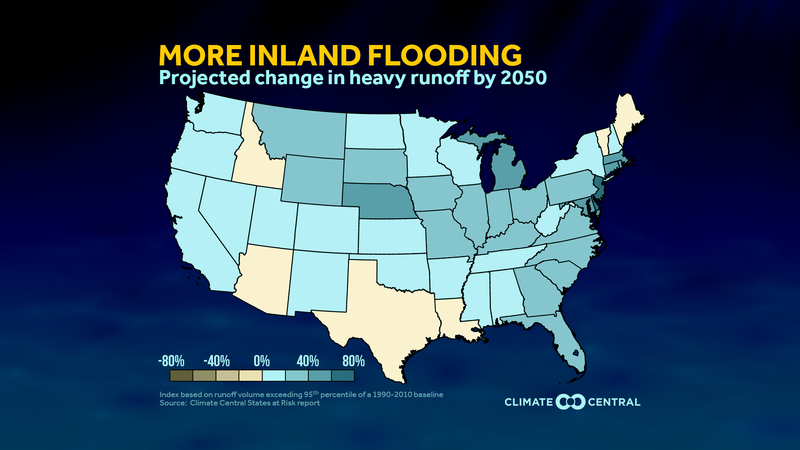 A Climate Central analysis shows that by mid-century, heavy runoff from rain-driven inland flooding will increase between 20 and 40 percent. 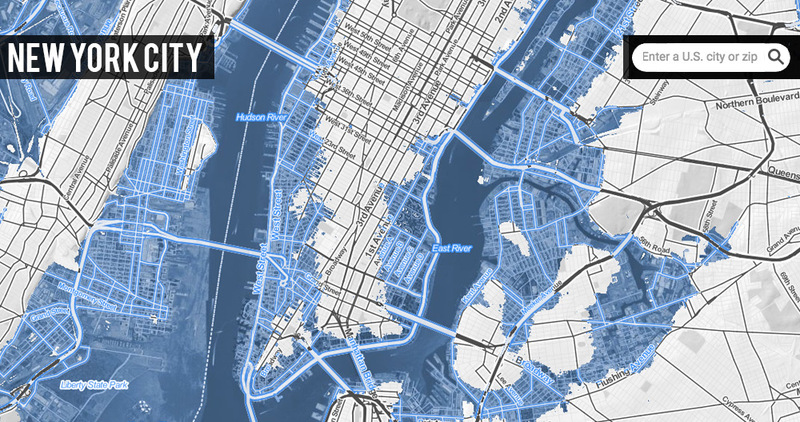 Of course, climate change isn’t the only thing that impacts flooding, as the built environment, such as impermeable pavement, exacerbates flooding in urban areas like Raleigh. While this area of North Carolina has seen about 400 percent of what would normally fall over the past two weeks, mostly from this storm, much of Florida has been left thirsting for storms to quench the dry conditions that are helping to fuel wildfires. The blazes have burned the largest area of the state since 2011, some 115,000 acres, and will likely cost millions of dollars in damage and fire fighting costs. 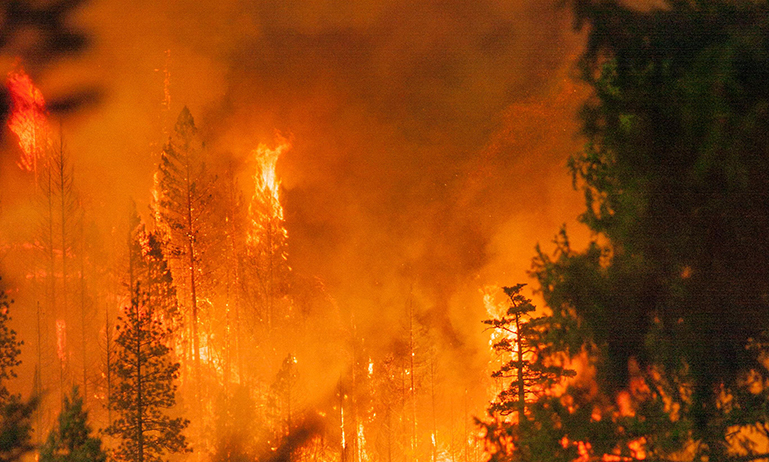 Winter wildfires are a feature of Florida’s climate, which has a clear dry season from about mid-October to mid-May, state climatologist David Zierden said, which elevates wildfire risks. During La Niña years (which feature cooler-than-normal tropical Pacific waters), Florida winters tend to be warmer and drier, with busier fire seasons, which was likely a factor this year, even with a relatively puny and short La Niña. Since mid-October, a lot of areas of the state are running at about 50 percent of normal precipitation, which “really set the stage for this wildfire activity,” Zierden said. There are a few more weeks of dry season left and those can be particularly dangerous as temperatures climb and increase evaporation, drying out potential fuels. “We’re right about in the peak of it, probably have a few more weeks to go,” Zierden said. 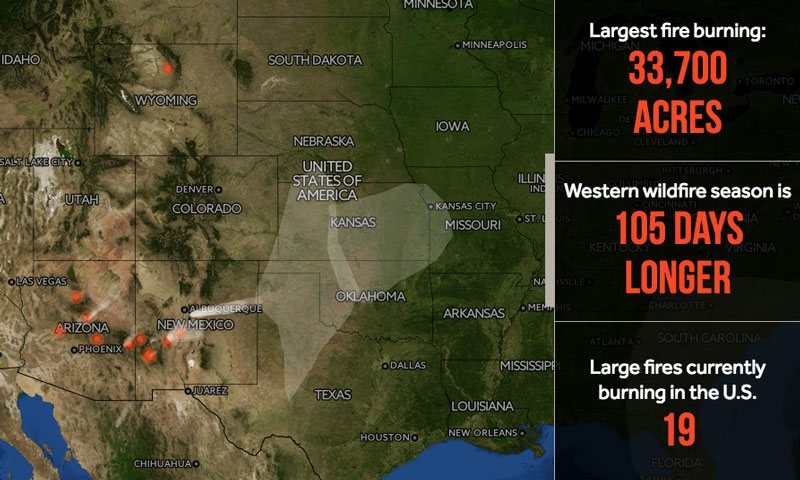 Several counties have instituted burn bans, as most dry season wildfires are caused by human activity, like burning trash or throwing out cigarette butts. The very warm conditions in Florida over the winter have likely exacerbated the drought and the wildfire risk, Zierden said. The state has seen a streak of 14 warmer-than-normal months and 2016 was the second hottest year on record for the state. Rising temperatures are likely the clearest climate link to Florida’s current conditions, because as temperatures continue to rise, the effects on evaporation could exacerbate future droughts. Likely trends in overall precipitation over the state, on the other hand, are unclear. Relief from this drought and fire season is on the way, though, Zierden said, as the wet season should start kicking into gear soon. Summer storms could initially increase the risk from lightning-caused fires until enough rain falls to really moisten vegetation, but by early summer, the risks should be tamped down and the drought on its way out.